Oil prices are on the rise this morning, with WTI crude oil up about 31 cents this morning. Crude picked up 74 cents (1.3%) yesterday amid news of a pipeline disruption in Europe. 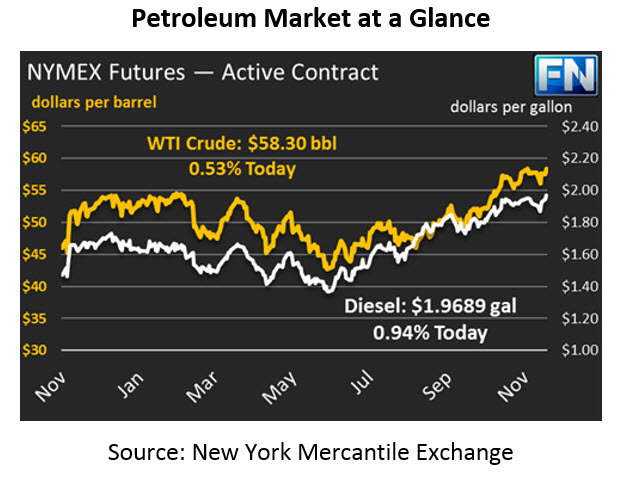 WTI crude prices are currently trading at $58.30 this morning, the highest they’ve traded since early December. Refined products are also receiving a boost. Diesel prices picked up over two cents yesterday thanks to continued demand strength, especially during a chilly winter with numerous snow storms hitting the East Coast. Diesel prices have once again pressed against two-year highs, peaking above $1.98 before retreating. Prices are currently 1.8 cents (0.9%) above yesterday’s closing price, trading at $1.9689. Gasoline prices posted gains of roughly a penny yesterday, buoyed by crude oil gains but lagging behind diesel’s gains. Large expected inventory builds weighed on prices yesterday; today, markets are waiting for API data to confirm those builds. Today, gasoline is doing a better job of keeping track with the market, gaining 2.2 cents (1.4%) to trade at $1.7487. Damage to the Forties Pipeline, a major pipeline in the United Kingdom’s North Sea, has sent Brent crude oil soaring, and WTI is catching a bit of the uptick. The pipeline feeds a significant portion of fuel into the UK, causing severe disruptions for European consumers. Brent-WTI spreads immediately surged from $6 to $6.70, even surpassing $7 at times this morning. Widening price spreads will likely be reflected in the inventories reports next week, since it’s too late to be included this week. Repair of the pipeline is expected to last weeks, meaning exports could remain elevated going into the new year. One major bank, Commerzbank, reported yesterday that oil prices may be prime for a “massive price correction” in the first quarter of 2018. Financially, a correction is defined as a loss of 10% interrupting an upward trend. The bank views a pullback as a natural response to the strong growth in oil prices this past year. Continued growth in U.S. supply will create an oversupply situation in 2018, leading markets to react negatively. The bank went so far as to predict that WTI crude could trade at $47 in Q1 2018.